This striking A frame chalet has a great look and a great location. 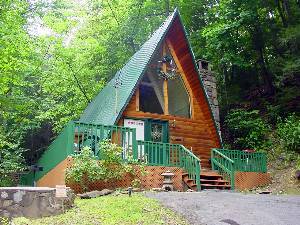 We’re sure it will make a great setting for your Smoky Mountain getaway! The green tin roof and faux log siding is only the beginning of this cabin’s perks. 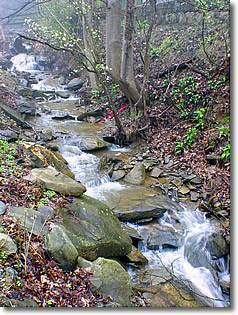 The creek that gives this home its name runs beside it year-round. 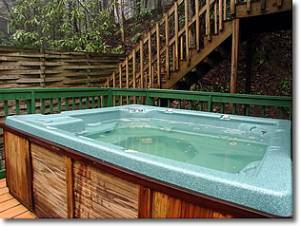 You can enjoy it from the wraparound deck with its inviting hot tub or while preparing dinner on the nearby charcoal grill. If you step inside you immediately notice the attractive modern furnishings present throughout the home. The setting is even more memorable thanks to the angular nature of the walls and high ceiling associated with A frame construction. You enter the living room through either the front door on the sliding glass door on the deck. Here white walls and plenty of windows create a bright atmosphere. The floors are covered with plush carpeting. 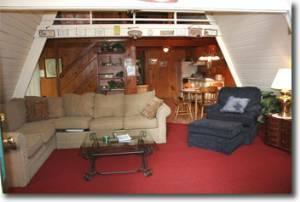 There’s a gas fireplace on one side of the room and the wrap around sleeper sofa on the other. There’s also a cable TV with DVD and VCR. 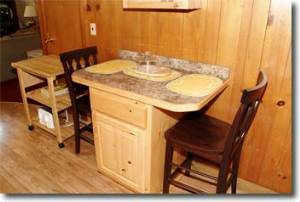 On the opposite end of the home is the fully furnished kitchen and dining room (with space for 6). This space features mostly natural wood surfaces. Move further into the home and you’ll find the first bedroom and the downstairs full bath. This bedroom has a queen size bed and has direct deck access, as well as a TV with VCR. Upstairs is the home’s second bedroom. 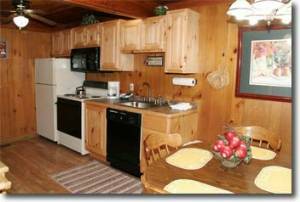 It has a queen size bed and TV with VCR/DVD as well as a private half bath. There is also an access door for the rear of the home. Don’t worry about being bored. 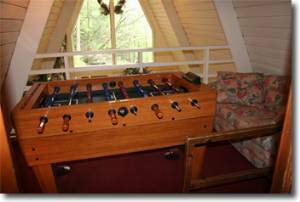 In addition to all Gatlinburg has to offer there’s also a miniature lounge area with love seat and foosball table in the upstairs loft. 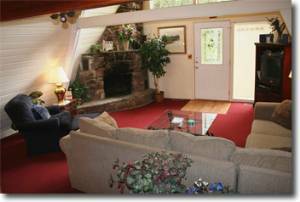 A distinctive look with a convenient location makes Kozy Creek a great place to stay year-round!